Explore more, straying off the beaten track. Experience ice caves, glaciers walks and many waterfalls, while also exploring the Golden Circle and the best of the South coast. This five-day tour is a great option for people who really want to make the most of their time in Iceland. This self-drive tour allows you to create unforgettable memories in the South Coast. 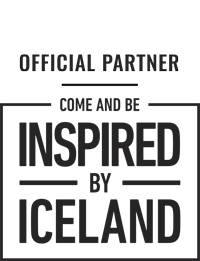 A once in a lifetime magical four night /five-day journey filled with adventure and new places. Get off the beaten track and explore local villages and enjoy the tranquility of vast open spaces and stunning scenery, while also making sure to not miss out on the famous attractions; Golden Circle, ice caves and glacier walks. 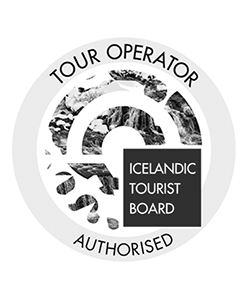 This Self Drive Iceland tour is the easiest way to relax on an an adventurous holiday and spend time with your family! When booking for 2 or 4 persons you get twin / double rooms. When booking for 3 or 5 persons you get a combination of double/twin rooms and a single room. To offer the best price possible, this self drive package is fixed and cannot be changed or altered. The package has been optimized for the best experience. Day one begins with the collection of your rental car. Pick up your rental car from the airport, if you are picking your car up from Reykjavik you will need to stay one night in the capital, in order to collect your car from the BSI station the next morning. The road trip starts now! Make your way around the Golden Circle route at your own pace, calling in at Thingvellir National Park, Geysir and Gullfoss waterfall. The Golden Circle is the most famous road trip of Iceland – you can’t come to Iceland without doing it! Most people start at Thingvellir National Park, which is home to some fantastic geology. 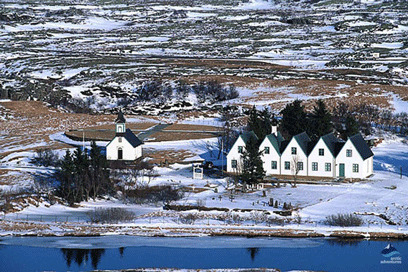 Thingvellir park includes the Silfra fissure zone – between the tectonic plate boundaries of the Mid-Atlantic Ridge, between the North American and Eurasian tectonic plates. If you have time, we recommend booking a snorkelling tour, where you can snorkel between the 2 tectonic plates, to get a unique view at the strava of lava rocks, with visibility at over 150 metres deep in some areas. 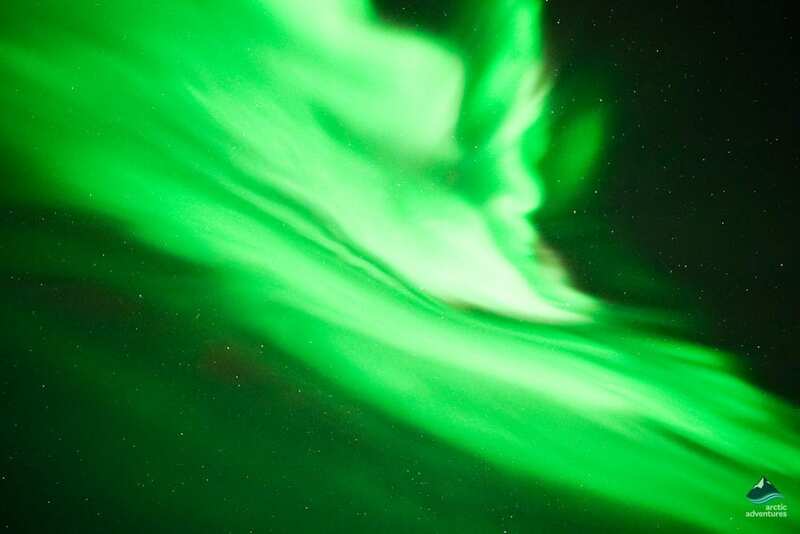 Thingvellir is not just great for divers, it is an area of outstanding natural beauty as a UNESCO World Heritage Site. The first ever parliament was started here in 930 AD, called Althing. 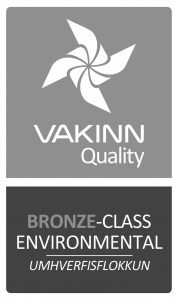 Althing has a huge role in Icelands past, it’s Iceland’s longest running and highest institution of government. 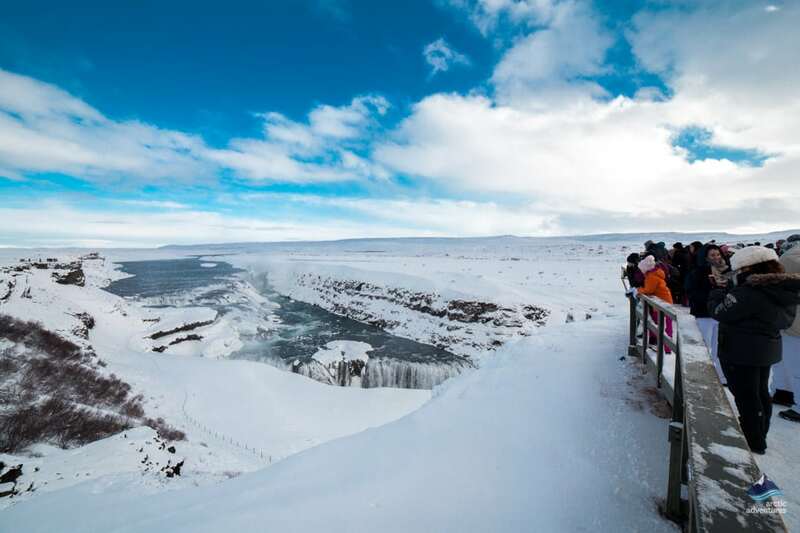 Depending on your route, at some point you’re going to want to head to Gullfoss. Gullfoss Waterfall is the most popular waterfall in Iceland (as proven by the parking lot -you’ll see). You’ll want to spend a while at The Golden Waterfall, walk around the cliff to get different views. Wherever you stand, Gullfoss is stunning. It’s water thunders down drops of 21 metres and the canyon walls of 70 metres. On a sunny day, the fall is alive with rainbows and a golden hued spray! Geysir geothermal area is the last stop on the Golden Triangle, this is the place where the now dormant Great Geysir impressed scientists so much, they names all sprouting springs after it. It’s hard to believe this quiet hot spring once erupted boiling water up to 70 metres (230 ft) in the air. 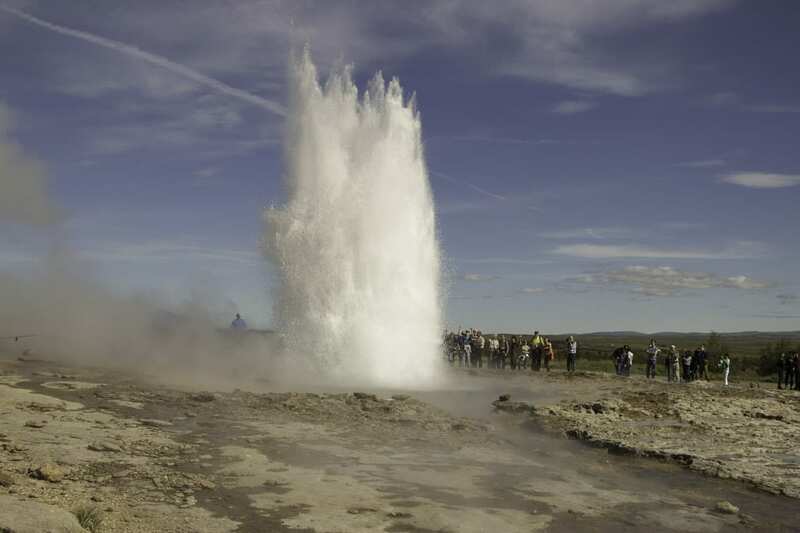 While it is now dormant, Stukkar, also located within the geothermal area, has become the attraction and is much more active! Every 5-8 minutes this younger spouting spring erupts water up to 30 m in the air! Located in Haukadalur valley, the geothermal area has many other features worth visiting. Fumaroles, mud-pits, hot-springs and smaller geysers are spread out around Haukadalur, while the ground itself is a color pallet of reds, greens and yellows, dyed as a result of sulfur and other chemical reactions. While driving, be sure to make pit stops at Faxi waterfall and Kerið Crater! Not technically part of the Golden Circle, but on the route, it is well worth taking a quick detour to explore and photograph this wide waterfall and volcanic lake. 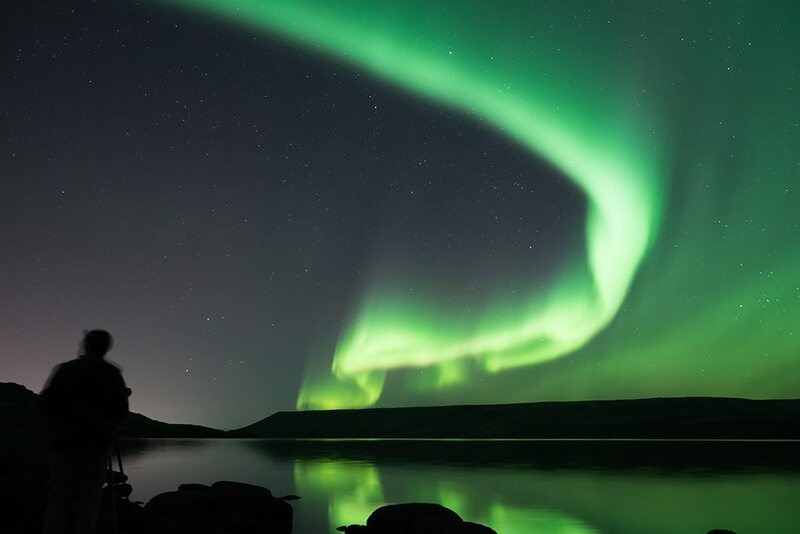 After the day of sightseeing, you can arrive in your hotel, in the Golden Circle or Hvolsvöllur area, and rest up for another road trip tomorrow, or stay up and keep an eye out for any signs of Northern Lights! At some point in today’s busy itinerary you must make time for a glacier experience on Sólheimajökull. 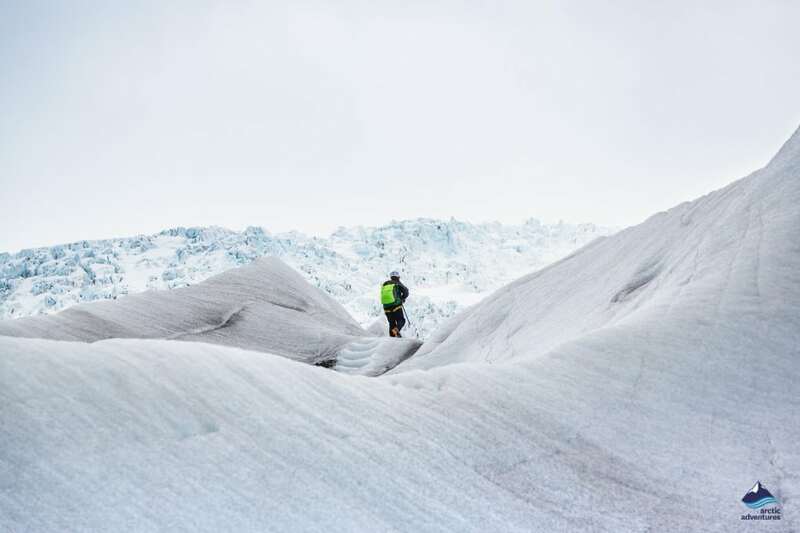 Sólheimajökull glacier is an easy walk with stunning views, surrounded by some of Iceland’s most spectacular volcanoes. This glacier hike is a once in a lifetime adventure and with the rapid rate of global climate change, this popular activity is only available in very few parts of the world. Remember to bring warm outdoor clothing, a waterproof jacket and pants, headgear and gloves. Good hiking boots are also recommended. 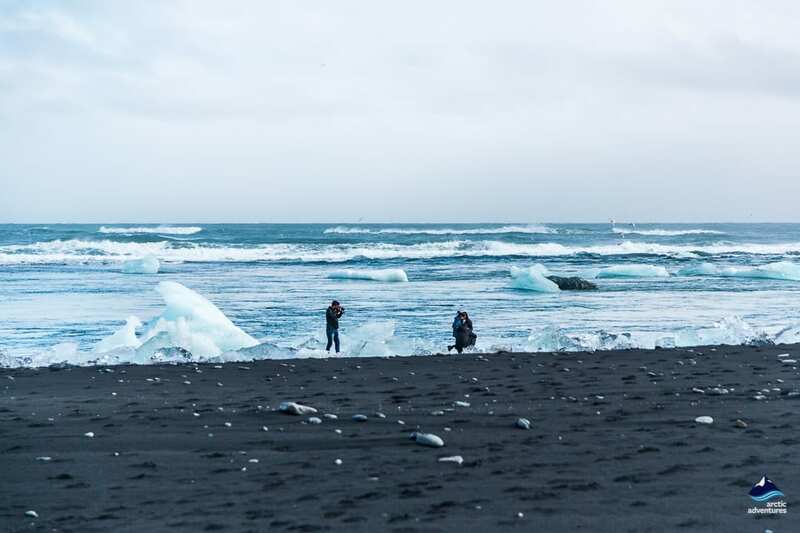 Black sand beaches, wonderful waterfalls and gorgeous glaciers can all be found along the South Coast of Iceland. 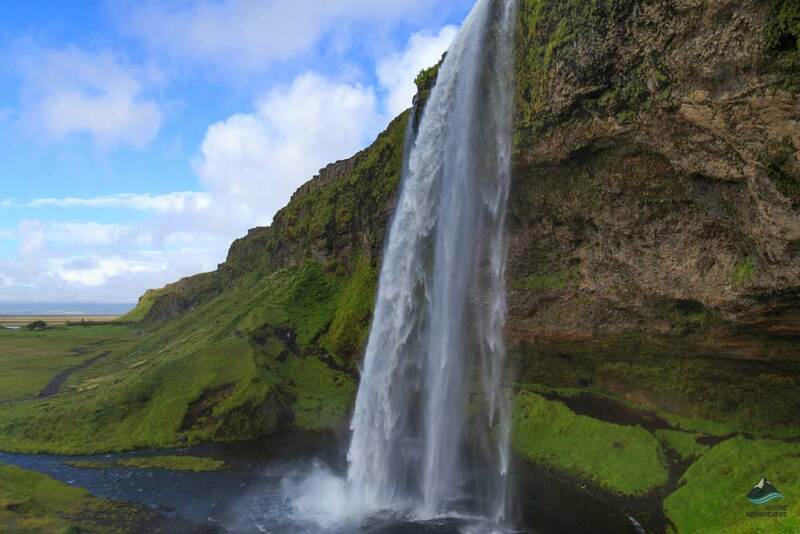 There is no set route, but we recommend checking out Seljalandsfoss and Gljúfrabúiwaterfalls in the morning. These are found by Route 1 and from the road that leads to Þórsmörk Road 249. Seljalandsfoss is the main waterfall in the area and you can take great pleasure in being able to walk all the way around. The water drops from a height of 200 feet and its origins can be traced to underneath the glacier; Eyjafjallajökull. Gljúfrabúi is also within walking distance nearby, slightly hidden behind a rock face. Seljalandsfoss tends to attract the crowds, but Gljúfrabúi tends to be missed by those who do not know it’s there! Making it a lot more tranquil and quiet away from the crowds of Seljalandsfoss. A hidden gem. Skógafoss is another popular waterfall also on the South coast. It has a similar drop of 60 metres, similar to Seljalandsfoss, but a width of 25 metres. On sunny days you can see rainbows form from the spray and you can also climb the steps to the top and see it from above.If you are prepared to get wet, you can walk right up to the waterfall and stand in it’s spray. Not far from the waterfall, around 3 miles away, is the small village of Skógar, which is popular with tourists. Although a tiny village with a population of just 20, the village runs a successful museum. Finally, you should leave some time in the evening to visit Vík í Mýrdal town, before you find your hotel. The village of Vík is the southernmost village in Iceland and is proving popular amongst tourists, as a result of the many beautiful views and landscapes it contains. The village is set opposite Reynisfjara black sand beach which is considered to be one of the world’s most beautiful non-tropical beaches. 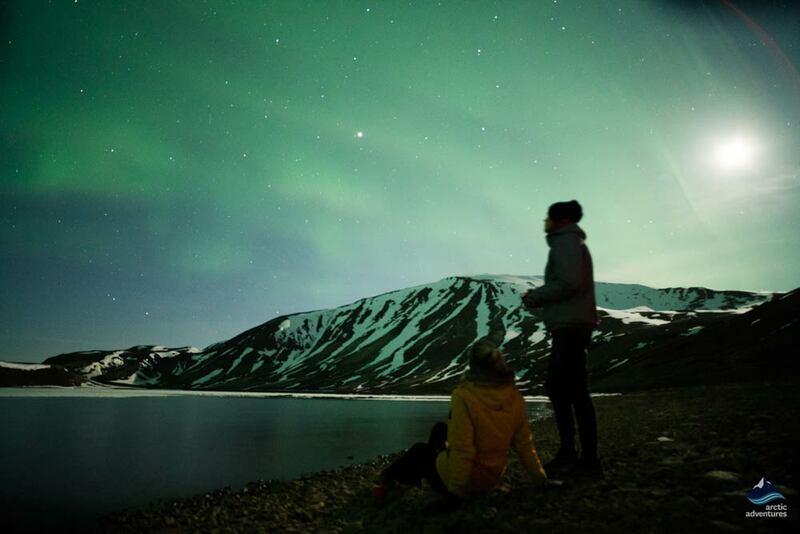 If conditions allow, this is a great place to catch the Northern Lights, before arriving at your hotel in either Klaustur or Skaftafell. Day 3 will take place in and around Skaftafell national park. Skaftafell is a preservation area which has landscape very similar to that of the Alps. Today you will take part in a ice cave tour! 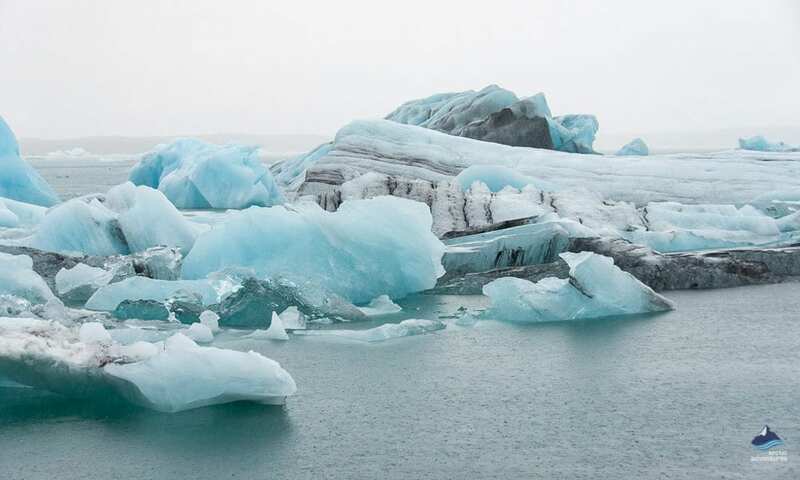 The Crystal Ice Cave tour departs from Jökulsárlón Glacier Lagoon and is up to 3 hours in duration. 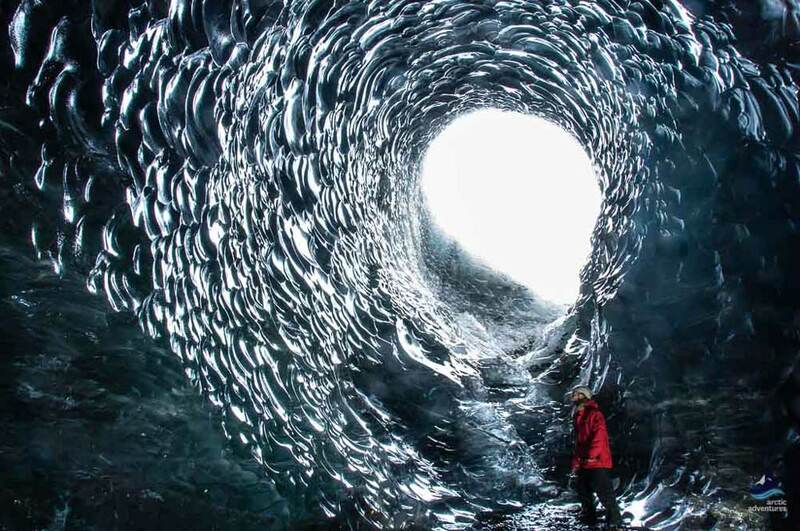 An off-road jeep will drive you to a large ice cave found near Breiðármerkurjökull Glacier. This tour offers you the chance to venture inside the crystal ice cave and take photos of its picturesque crystal surroundings. Once inside the Crystal Cave, you will have about 40 minutes to explore its wonders at your own pace.This is definitely a must see for all and especially photographic enthusiasts! The blue light seeping through the dense ice is unique and it gives the cave an adventurous atmosphere. 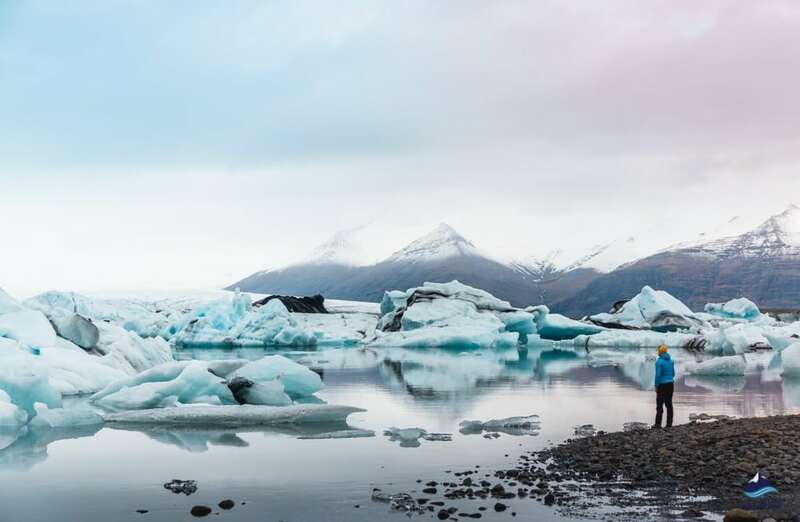 Your morning will likely start off in Skaftafell park, before you head out to Jökulsárlón. A famous waterfall feature is the main attraction within the park, and measuring 20 metres tall and surrounded by unique dark basalt lava columns it’s impossible not to be mesmerized. You cannot see Svartifoss from the road and the hike up to it takes around 45 minutes, so if you’re lucky, you may be the only one there! If you want, you can walk straight down to Svartifoss to see it up-close or instead go straight to the top by climbing the stairs. After Skaftafell you will have an allotted time to go ice caving from Jökulsárlón Glacier Lagoon, where you will spend the rest of the day. Jökulsárlón is Iceland’s most famous glacial lagoon, bordering Vatnajökull National Park. The lagoon features a lake filled with the meltwater from an outlet glacier and is one of the most awesome natural wonders of the world.It is predicted that within the relatively near future, the lagoon will continue to grow until it becomes a large, deep fjord. The glistening blue and white icebergs wash up on the black sands of the famous Diamond Beach, where you can really appreciate the colors and the magnitude up close (not too close though – under no circumstance should you climb on an iceberg). Further out to sea you will be able to spot icebergs, some as large as apartment blocks, bumping into one another in the lagoon! Blue and white icebergs of all shapes and sizes glide in silent procession as they sail off in the wild waves of the Atlantic Ocean. After a day of spectacular landscape and nature, arrive at your hotel in either Skaftafell or Höfn to prepare for tomorrow’s adventure. For Day 4 you will spend your time hiking and sightseeing in South East Iceland, in Kirkjubæjarklaustur. In the morning you will start the day with a brisk hike up Lómagnúpur mountain- arguably the most photogenic mountain in Iceland/ the mountain on that postcard you bought. 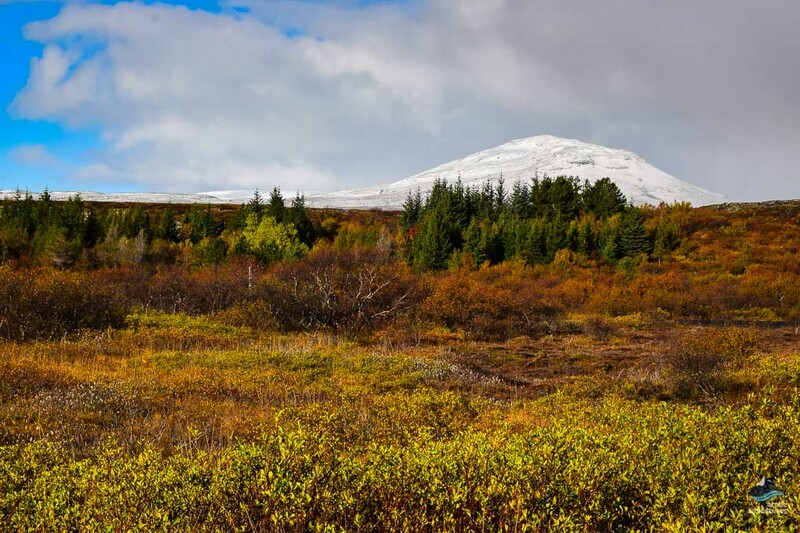 Lómagnúpur mountain is actually a subglacial mound, found between the Kirkjubæjarklaustur village and Skaftafell area, with an elevation of 764 metres and prominence of 166 metres. 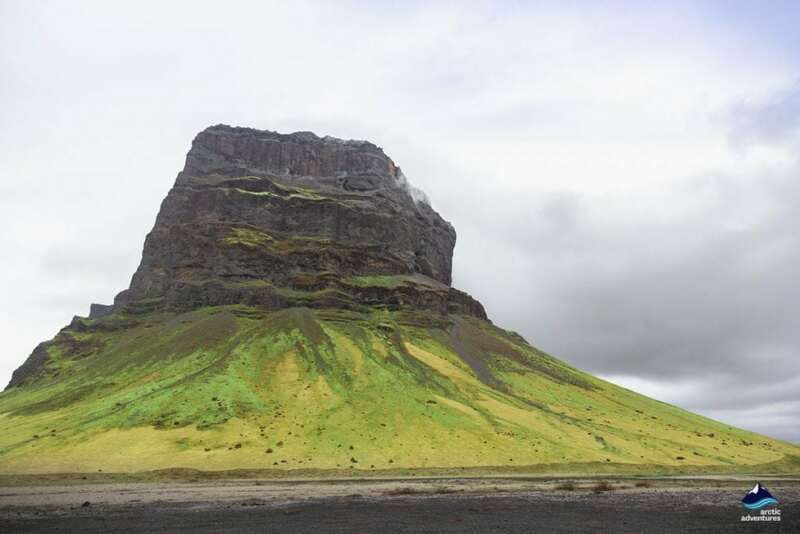 Arguably, one of Iceland’s most recognisable mountains, Lómagnúpur was formed of palagonite over 1 million years ago. After the hike has woken and warmed you up, keep driving 10 km east on the Ring Road towards Kirkjubæjarklaustur village and you will find the unmistakable Dverghamrar cliffs. This canyon may be small but often that is more impressive! The Dwarf Cliffs are one of the most stunning rock formations in Iceland, with hexagonal columns of basalt, topped with cube-jointed basalt, curved like a horseshoe. It’s a great pit stop to take a break and stretch your legs for half an hour or so, before continuing on. Next to visit we recommend Kirkjubæjarklaustur village. The village is home to a few shops and services and is a popular stop for tourists. ‘Klaustur’ is one of the few villages providing amenities, such as fuel, shops, a bank and a supermarket. Packed with tradition and local history, Kirkjubæjarklaustur village is a fascinating town to spend a few hours. The Church floor or ‘Kirkjugólf’ is just east of Kirkjubæjarklaustur, formed of eroded basalt columns shaped by the weather, glaciers, and the sea. The basalt gives the appearance of a man-made tiled floor. If you are passing by the area, the floor is worthy pit stop if you need to stretch your legs! Before traveling about 250 km (155 miles) back to Reykjavik, you need to check out 2 more places; Fjaðrárgljúfur and Reynisfjara beach. Fjadrargljufur Canyon is a great place to hike and take in nature and well worth the time and effort.The views are captivating and the canyon will blow your mind! The hike is an easy 1.25 mile trail that leads to a lookout point, overlooking a waterfall. At some points the canyon walls reach a height of 328 feet tall! 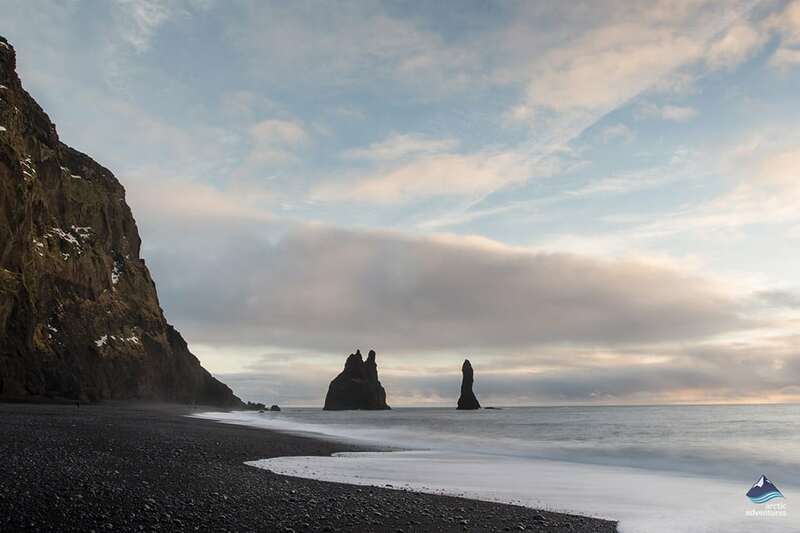 Finally, a week in Iceland cannot pass without an evening stroll on the beach, particularly world famous Reynisfjara beach cannot be missed. 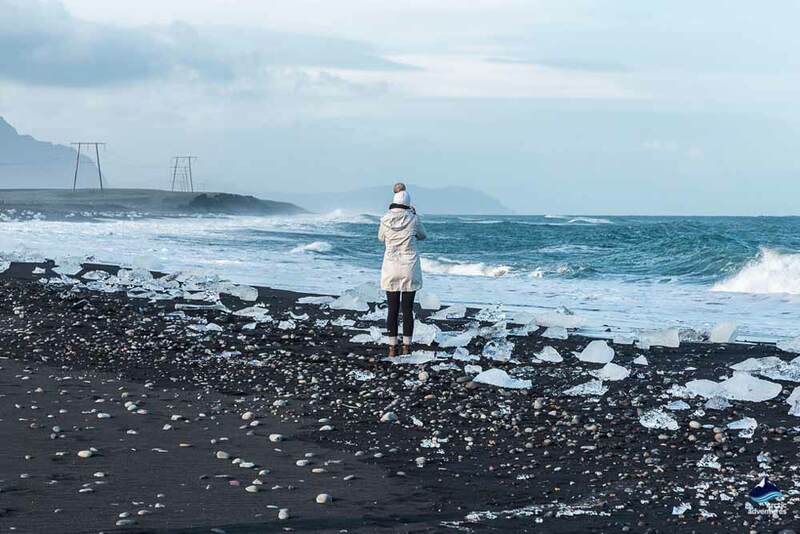 Adjacent to the small fishing village of Vík, this black-sand beach, is famous for huge basalt stacks, it’s Atlantic waves and captivating panoramas. After another busy day, arrive at your hotel in the capital area. Reynisfjara is around 180 kilometers (112 miles) from Iceland’s capital city, Reykjavík, roughly a 2.5 hour drive. 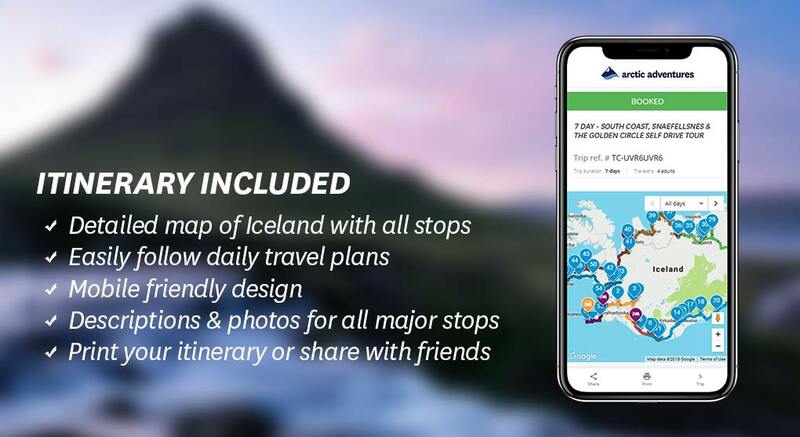 Depending on the time of your flight, there’s still some activities you should try and squeeze into your last day in Iceland, if you have the chance! 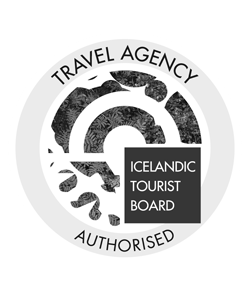 Points of Interest include Kleifarvatn Lake, Hópsnesviti Lighthouse, the Blue Lagoon, Hópsnes peninsula, Reykjanesviti Lighthouse and the bridge between the continents. But prioritise time to get to the car rental drop-off and getting to the airport with time to spare! Figure out what works for your schedule. Kleifarvatn Lake is a popular activity not far from Reykjavik. About 10 km² and the largest of Reykjanes peninsula, the lake is about 97 m deep which makes it one of the deepest lakes in Iceland! In the southernmost part hot water from several hot springs run into the lake and warm it up, but elsewhere the lake is very, very cold! The nature of the volcanic surroundings make the lake a great place for photographers, the surroundings of the lake are uniquely beautiful. Another option is Hópsnes viti Lighthouse. Hópsnes is a small peninsula in Grindavik which was formed during an eruption. Hópsnes lighthouse was built in 1928 as from the road you will be able to see many shipwrecks which have been stranded. The lighthouse has a great view of Eldey island on clear days and is a nice place to take a walk on a sunny day. 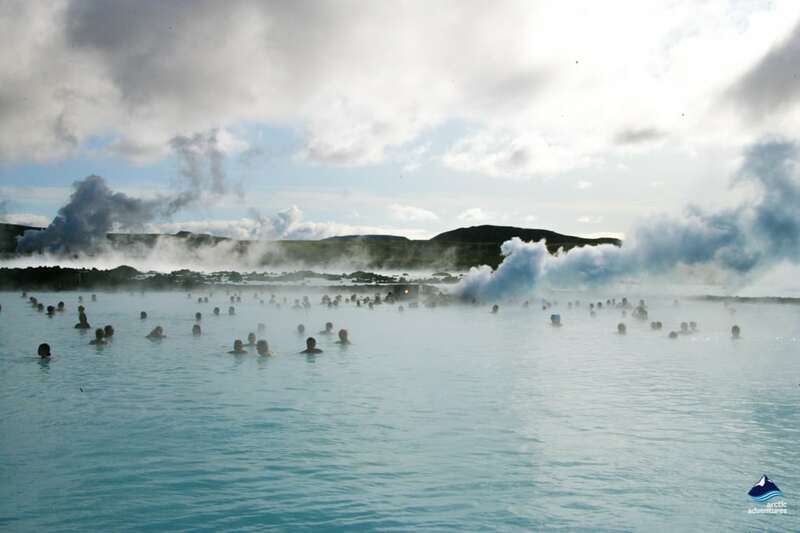 You may want to head to the Blue Lagoon, as it is near to the airport and one of Iceland’s best tourist attractions! Entry fee is not included in this tour, but it is well worth going to the lagoon for the instagram selfie alone! The lagoon is not just a pool, but treated more like a spa and there is both a sauna and a steam bath. The water is a blend of sea-water and geothermally heated water which is rich with silica, minerals and algae, really good for your skin, mind, body and soul. You can read more here. You may wish to see the Reykjanesviti Lighthouse on Bæjarfell hill instead. The light signal height is 69 meters above sea level and the actual height of the lighthouse is 26 metres. Reykjanesviti is close to the geothermal area Gunnuhver, which is famous for the largest mud pot in Iceland. As the lighthouse is on the Peninsula, it is relatively close to the Blue Lagoon, while also near to the Bridge Between the Continents. The Bridge Between Continents is a small footbridge over the fissure of the Mid Atlantic Ridge, providing clear evidence of the presence of a diverging plate margin. The bridge serves as a symbolic gesture representing the connection between Europe and North America. A great photo opportunity, you can stand either side of the North American and Eurasian plates simultaneously. Make sure you leave plenty of time to return your rental car at the airport. When you arrive at the airport again you drop the rental car off at the car rental, free from the hassle of busses or challenging luggage transfers or storing. We hope you enjoyed your time in Iceland and have a safe flight home!